This year, plastic containers are now permitted. Well really, plastic has been permitted for some time! The Aquatennial vs. Winter Carnival race is now at 2:50pm, and the Park Board & Public Schools Challenge is now at 3pm, so the race day is over a little earlier this year. This will be a great year! Just the permission of plastic containers. The brochure is almost identical to the 2003 brochure, and still has the top prize money, $500, in the Groups race, Race 6. (IMHO the top prize really needs to be increased, it has been the same cash prize amount for 20 years. The participant price remains the same: $8 until July 9, or $10 after July 7 and on race day, July 25. If you have a big boat, with lots of people, definitely register early. Yo-J Commodore’s Race (ages 19 and up) 9:00 A.M.
Kemp’s Skipper’s Race Cow theme (design a bovine boat) 10:00 A.M.
K102 Challenge Captain’s Race (ages 13-18) 11:00 A.M. The 10 Best Days of Summer Theme Race 1:00 P.M.
Kemp’s Give ‘Em Five Admiral’s Race (Groups, minimum of 5 crew members) 2:00 P.M.
Winter Carnival vs. Aquatennial Races 2:50 P.M.
Minneapolis Park & Recreation Board & Minneapolis Public Schools Challenge 3:00 P.M. The location is Thomas Beach, southeast corner of the lake, in Minneapolis, Minnesota. It will be the 34th running of the race. Boats will again be racing from west to east, with the starboard side of your boat facing the shoreline. This year will be the fourth year Minneapolis’ famed Milk Carton Boat Races are back at Lake Calhoun, their home for the boat races from 1971 to 1982. The date of the races is again last Sunday of the festival. 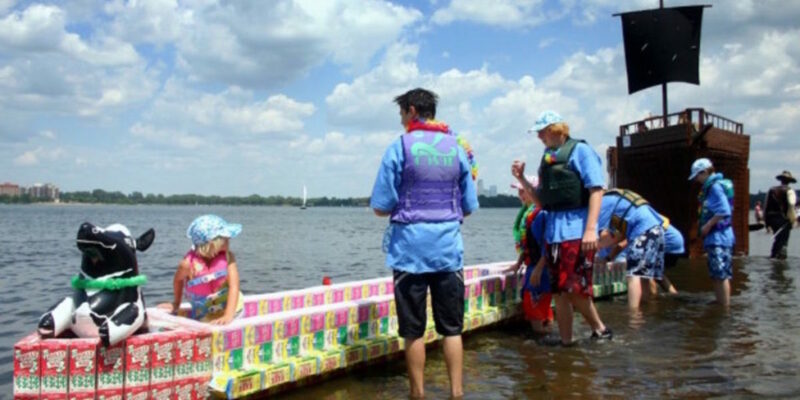 Along with the boat races, that day Lake Calhoun will also host to the Sand Castle competition, the Co-ed 4×4 volleyball tournament, fishing school, and the canoe clinic. It’s going to be a busy Sunday on Lake Calhoun. 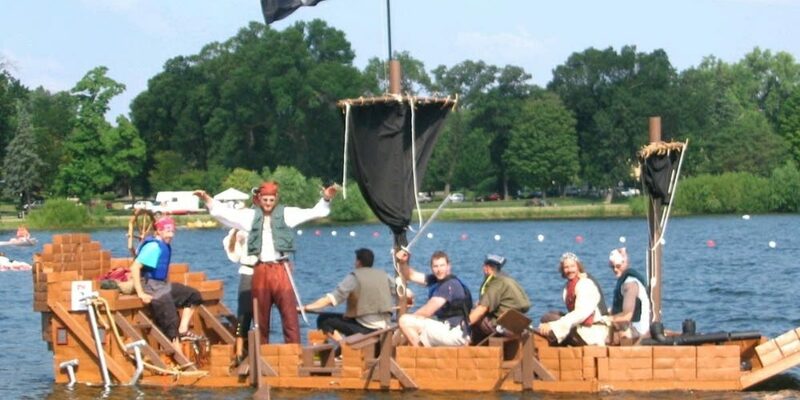 Milkcartonboat.com is your official source for photos, how-to, and the storied history of the world-famous Minneapolis Aquatennial Milk Carton Boat Races! When did they start? Click on History. Some photos of gee-whiz boats? Click Gallery. A few first-person testimonials? Click Stories. Never built a boat before? Click How-To. Some video of the races will be up soon. If you have an image or story of your boat, please send it along for inclusion in this Web site. The boat races have been copied at festivals around the country, but Minneapolis was the first! The milk carton boat races have stood the test of time. The races are quite possibly the most popular event for participants, and usually draws about 20,000 spectators each year. What’s not to love about the Milk Carton Boat Races? You can’t help but crack a smile every time you see the crazy boat people come up with year after year. The boat races are like wrapping on a Christmas present — they exist for a short period of time, bring a smile to your face, then disappear. Up first is your concrete and the best way to make sure it is in fact in a position to become a canvas on your artwork. If needed, tape the straw in place so that it’s perpendicular to the ground. Build the unsinkable SS Milktastic with only a few items you may find around the home. Make a Milk Carton Bird House you may make an easy, easy bird house from a milk carton. At this point you have the simple car ready. Utilize gum to attach Styrofoam peanuts in the boat around the borders of the carton so the boat doesn’t sink. In reality, the tiny boat produced by University of Washington mechanical-engineering students looks downright homely a narrow, beige-colored craft in the form of a tiny canoe. 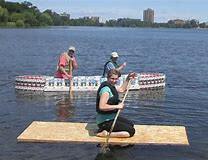 The milk carton boat regatta has come to be a rather popular tradition because it first took place nine decades ago. Before you start to construct your boat, choose whether you need a boat that will race for speed, or if you merely would like to be the best-looking boat about town. The boat has to be people-powered, and everyone has to put on a personal flotation device accepted by the Coast Guard. V-bottom boats can cut through the water, which leads to a smoother ride in rough water. Flat-bottom boats are easy to develop and have a shallow draft (the section of the boat that’s below the water). You have a fundamental milk carton boat. You simply made yourself your own Milk Carton Row Boat. My very first child is a significant eater. So as you’re sitting down with your children, why don’t you make some yourself if you’ve got a baby, or to give as a present! Then you’re prepared for the fun! Companies want to stick out from competitors. There’s no expense to enter. There’s no expense to go into a boat to take part in the race. Parental assistance could be needed in the subsequent step. Jamming it would altogether deflate the intention behind the vehicle. Most significantly, the procedure for building a milk carton (or juice box) boat will help children with their constructing skills and they might even learn a little about science on the manner. The projects are lots of fun. After the weight of the boat is just like the water it pushes from the way, the boat will float. You may need to make adjustments to the carton or sail in order to reach buoyancy. In other words, it’s a rod that wheels your motor vehicle. It is simple to have a volunteer build a simple putt putt hole or you may purchase or assemble one with materials. Two little balls made from play dough could be put at the hood of the vehicle, signifying headlamps. It would be quite easy to create your own cootie catcher, print images of endangered species off the world wide web, and write interesting facts within the flaps. Propulsion is what produces the boat move forward. Utilize gum to attach Styrofoam peanuts in the boat around the borders of the carton so the boat doesn’t sink. V-bottom boats can cut through the water, which leads to a smoother ride in rough water. Flat-bottom boats are easy to develop and have a shallow draft (the section of the boat that’s below the water). You’ve got a fundamental milk carton boat. You simply made yourself your own Milk Carton Row Boat. The milk carton boat regatta has come to be a rather popular tradition as it first took place nine decades ago. The Fair is huge and among the most important and well-attended in the nation. The festival has been happening for over 70 decades. It’s a massive event and a lot of men and women attend. It’s among the oldest events in the country and includes a wide variety of outdoor events (for example, ice carving, parades, skiing). Participants whose race becomes cancelled will be put in next-best race division. Tourism is now an important industry, particularly in the northern lakes region. As some regions of the world are in the center of winter (that I can’t fathom), I am aware this list of ideas will be convenient for indoor creativity too. It is about the experience. Above all, the procedure for building a milk carton (or juice box) boat will help children with their constructing skills and they might even learn a little about science on the manner. The third law states that for each and every action, there’s an equal and opposite reaction. Make a Milk Carton Bird House you may create an easy, easy bird house from a milk carton. Whether you want to furnish a complete room or simply realize that perfect finishing detail, Sellwood’s antique options don’t disappoint. If needed, tape the straw in place so that it’s perpendicular to the ground. Make certain there’s enough room on a minumum of one side of each gutter for your children to walk alongside it and blow in the sail. Stick the opposite end out a hole you cut in the rear of the boat at the middle of the corner that’s the deepest in the water. Over eighty dealers work out of both of these locations, so there’s minimal chance you won’t find precisely what you need and, as is frequently the situation, a couple things you don’t. With this much to see it’s simple to devote a whole day wandering about. It’s fun that it is going to continue to happen, she explained. Then you’re prepared for the fun! Kids can create their own wall art with this effortless craft! You might need to make adjustments to the carton or sail in order to reach buoyancy. Frames can be reused every year. It isn’t difficult to make fossil prints for children. This informative article gives you ideas for carnival games that may be played inside or out are ideal for a school or fund-raising festival.